If your child complains that a tooth is sensitive to heat or cold or that it hurts to chew or brush, you want to do what you can to relieve the pain. Sensitive teeth can have many causes. In some cases, modifying behavior can help, while in others it might be necessary to make a trip to the dentist’s or pediatrician’s office. Sugary foods and beverages and inadequate brushing can cause tooth decay. The most common cause of dental pain is a cavity. Silver amalgam fillings have a high thermal conductivity. This can cause sensitivity to heat and cold. Brushing too hard can gradually wear away tooth enamel. Kids with braces often brush with a hard, back-and-forth motion, especially near the gum line. This can wear away enamel and cause sensitive teeth and gums. Teach your child to brush with a soft, circular motion. A broken or cracked tooth can become sensitive. Grinding or clenching the teeth or a misaligned bite can cause small fractures in teeth. 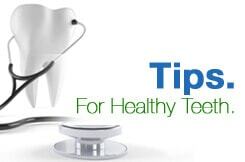 New teeth that are not used to being exposed to the air and food can become sensitive. The discomfort should subside as the teeth become accustomed to their new environment. The pressure from sinus and allergy issues can cause a feeling similar to tooth sensitivity. If your child is congested or has a history of allergies and is also complaining about tooth sensitivity, visit your pediatrician to find out if they are related. If your child’s sensitivity is caused by tooth decay, it will be necessary to have the cavity filled or possibly have the tooth extracted. In-office fluoride treatments can help prevent further decay. Fluoride strengthens tooth enamel and reduces the risk of decay. Fluoride gel or foam will only be needed if your child has a high risk of tooth decay. You can also get a prescription for a fluoride gel to use at home. Encourage your child to brush twice a day and floss once a day to lower the risk of tooth decay and periodontal disease. Using a toothbrush with soft bristles can reduce the risk of sensitivity. Check with your dentist before buying a desensitizing toothpaste for your child. Some products are not recommended for children under 12. For a child under 3, it might be better not to use a toothbrush and toothpaste until your child visits the dentist. You can use a clean washcloth or piece of gauze to wipe your child’s teeth and gums instead. If your child has sensitive teeth and you can’t figure out the cause, or if the pain doesn’t go away after changing your child’s brushing habits, visit your pediatric dentist. He or she can help you pinpoint the source of the sensitivity and suggest ways to treat it and make your child more comfortable.